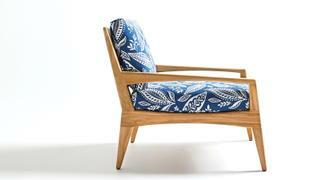 Since it was founded in 1979, Monterey-based manufacturer Summit has become the go-to choice for hotels, restaurants, villas, private clubs and, of course, superyacht owners looking for elegant, handcrafted teak furniture. 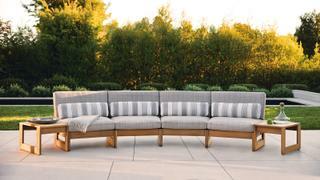 Under president and owner Jane Sieberts, Summit’s offering includes almost every piece of exterior furniture imaginable, from bar chairs to dining tables, footrests to sofas, plus everything in between, with all of its signature wood sourced from sustainable plantations. Collaborating with some of the world’s most famous designers, including British brand Linley, yacht interior connoisseur John Munford and, most recently, the Los Angeles-based artist turned furniture designer Alwy Visschedyk on a range of 1960s-inspired pieces called LA Mod, Summit has a reputation for high quality pieces that are at the cutting edge of style. While many of its pieces are undoubtedly mid-century in feel, the emphasis for Summit furniture is on functional, comfortable pieces that are both stylish and modern while being classic in design. All of its products are manufactured to meet marine requirements, and the recent launch of Summit Endurance Fabrics has extended this offering to include a selection of seaworthy upholstery fabrics, made of 100 per cent solution-dyed acrylic, which are both weatherproof and fade-proof. The newest addition to the Summit Endurance collection comes from a collaboration with respected interior designer Nina Campbell, who brings her impeccable taste for prints to a range of textiles. After honing her craft as an assistant to John Fowler, of Sibyl Colefax & John Fowler, Campbell has gone on to build a name for herself as an eponymous brand, working with clients as esteemed as the Royal Albert Hall and the Savoy in London. 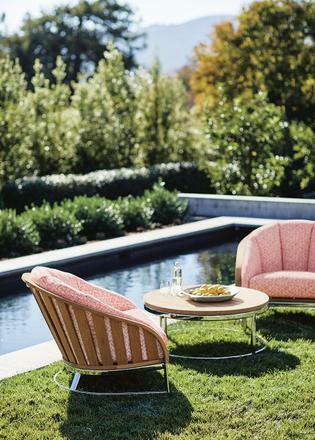 Now the designer has teamed up with Summit to bring her signature style to its fabric collection for outdoor furniture, creating five vibrant, contemporary patterns that can be used on pillows, throws and upholstery for sofas, day beds and armchairs al fresco. Inspired by gardens and nature, and in particular organic elements such as minerals and gemstones, Campbell’s five new prints are: Shanghai Labyrinth, a riff on the classic garden trellis motif with a graphic, maze-like design; London Crosshatch, a weave that mimics a painted, textured wall; Bahama Basket, a traditional woven basket design; Havana Leaf, which recalls the lush foliage and exotic plants of the Cuban jungle; and finally, Madagascar Stripe, a striped design based on a favourite Panama hat with its basket weave.